A series of related spatial “moorings” and “insertions” composed of mobile pool, foosball, and picnic tables designed to offer residents opportunities for easy interaction with trivialized urban spaces. 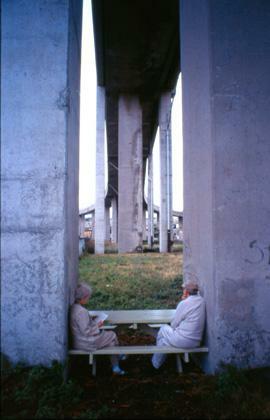 Simple interventions, like placing a picnic table between two highway columns, function as invitations to engage with the site. Another project attached wheels to pool and foosball tables, which were rolled around Montréal and Paris, inviting neighbours to interact with each other and cross barriers of class and wealth. SYN- atelier d’exploration urbaine, or “urban exploration workshop,” engages in urban exploration from the perspective of intervention and research. Actions: What You Can Do With the City presents 99 actions that instigate positive change in contemporary cities around the world.